There are no natural forces which can stop an Englishman from playing a game of cricket, or enjoying the spectacle offered by historical test series like the Ashes or the World Cup. Rain, wind or tropical storm, you can be sure the game will attract the attention of Pimm’s-drinking, panama-wearing fans, who promptly wait for the England team to actually win something (tough chance of that happening in any sport). The history of cricket is rich, though there isn’t really any official proof of how the game was born. Some accounts have the first games taking place in the Weald, in the South East of England, games which were played by children before finding their way to spoil-sporting adults (yes, they ruin everything). The game’s rules are possibly born out of bowls, with the addition of the use of a bat which is there to stop the ball hitting any of the wickets. Accounts of adults playing the game only appear in the early and late 17th century, though historians believe the game to be born way before that time. For example there are stories dating back to the 16th century, where the game of “creckett” is mentioned, most notably in a court case involving John Derrick, a coroner. In the 18th century historical accounts begin to tell of aristocrats and patrons forming the first cricket teams, teams which are usually given the name of the county they are born in. The game then gradually begins to find popularity outside of English grounds, and particularly English colonies seem to have a knack for the game, a tradition which will continue throughout the ages: the English usually invent a game only to be beaten by everyone else playing it. The game is then further refined with most of the current laws, including pitch size and bat width, being put in place due to gambling and stakes finding their way into the sport. Two famous 18th century clubs were Hornchurch and Dartford, with many others like Addington, Hadlow and London enjoying equal popularity. This century saw the official creation of county clubs which are still part of modern cricket, like the Sussex county club. The period then saw increased competition because of this, and the All-England-Eleven team was created not only to compete in England, but also to show their strength abroad. The team was made up of professional cricket players, and they helped in making the sport as popular as it is today. 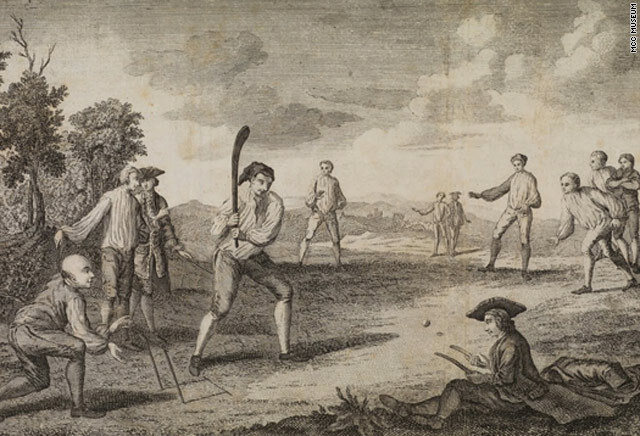 The first international cricket game also took place during this time, which was a game played between the USA and Canada, two nations which have likely abandoned the sport in favour of others. This started a number of overseas matches between various countries, like the England and Australian teams competing against each other in tours taking place in both countries. The Australians’ visit of England was a blast, and it practically gave way to the Ashes test-series as we know it today. The 19th century then marks the beginning of the history of Australian cricket, undoubtedly the most successful cricketing nation to date. Aside from international competition, England saw the rise of the first national championships, and soon other nations followed suit. The county championship was established in England, while Australia started the Sheffield Shield. South Africa, still an important cricket nation, started the Currie Cup, while the Ranji trophy was played in India. Cricket still remains the most popular sport in India, and the Ranji trophy is still being played.